Select from trend-forward Veneers, Textured Laminates or High Gloss Laminates to represent your style and personality for your next project. These products offer a look that is found in rooms that feature modern design sensibility — you'll find they add flexibility in both color and style when used within a room. Bamboo veneer cabinets range in color from light honey to dark amber throughout and features a straight, consistent grain pattern. The nature of bamboo wood includes small nodules, which are darker in color, and are randomly interspersed within the bamboo staves. Wenge, dark brown in color, is known for fine, almost black veins that fall in a straight and consistent grain pattern. A rare wood, Wenge is offered by Omega as engineered veneer cabinets, an environmentally responsible alternative to an otherwise endangered specie. 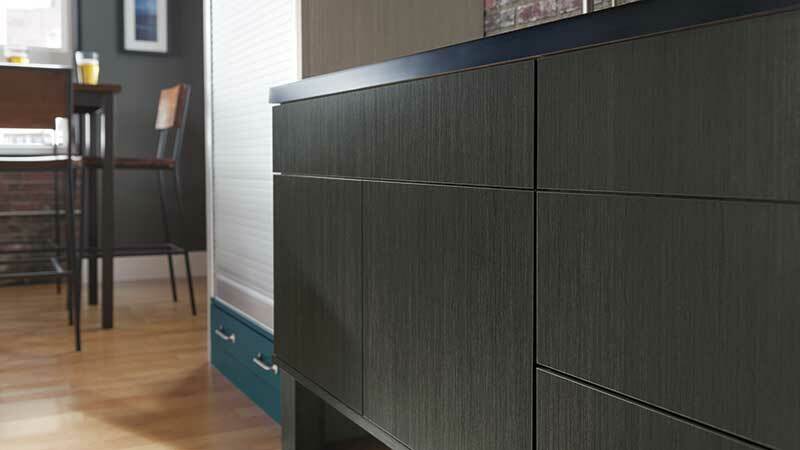 High Gloss Laminate cabinets add high style and a sleek look for a contemporary edge and European flair. Cabinet interiors feature white laminate for easy-to-see, easy-to-find practicality that delights. Textures are at the top of a trend-lovers list, adding tactile dimension and easy care perfect for modern designs. Textured Laminates offer easy care practicality, in a variety of on-trend colorations. Cabinet interiors feature white laminate for easy-to-see, easy-to-find functionality.